Aviary opens with what could've been a rousing finale. 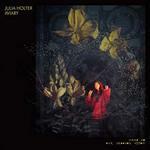 On Turn the Light On, Julia Holter cries out with wild abandon as a turbulent orchestra teeters with overblown opulence. It's that majestic in construction, a chance for the Los Angeles composer to reacquaint herself with her deconstructionist approach to songwriting. It leads us to believe that Holter is operating on a higher plane, completely unbound, pushing her high art as far as it can go. But in testing those limits, Holter also likes to encapsulate musical experiences that surge with life-affirming zeal. Going as far back as 2012's Ekstasis, she reconfigured this notion that complicated music can be just as palatable as a three-minute pop song. Holter is the rare modern composer who has bridged that gap between art and commerce with changeable versatility. She writes music that sounds difficult and abstruse at first glance, but there's always that hidden pitch or tone that arouses instant curiosity. Sometimes, like in 2015's Have You in My Wilderness, those moments are easier to detect. Even if Holter's thematic subjects are marred in intellectualism -- from French novellas to tragic Greek heroes -- she seems more interested in delivering experiences that don't require a Cliff Notes study guide. Does it sometimes come across as calculating in design? Definitely. But Holter knows better than anyone that her art is subject to free interpretation, and as such, these concepts can take a lateral focus rather than reflect some kernel of essential meaning. That is not to say that Holter doesn't intend to challenge her listeners, but judging by Aviary's temperamental sequencing, she also appears to be summoning her creative courage as well. After the grand suite of Turn the Light On, Holter takes a 180 degree turn into minimalist art rock on Whether with a matted assortment of droning bagpipes and anxious siren snyths. Considering the roundabout nature of the album, she applies some of the briefest, most immediate statements early on before she decides to let them run loose. From the spacey, Kraftwerk-like synths and digital clippings of Another Dream to the sepulchral march of I Would Rather See, Holter makes sense of a dystopian future by borrowing and interpreting from classic poets who envisioned our troubling fate centuries ago. It is true that Aviary runs a prodigious 90 minutes, but if you let it play without being conscious of how it's structured, you might as well be listening to a formless, avant-garde suite with the occasional breaks which assimilate as songs. There are many familiar motifs that recall Holter's past work throughout Aviary, from jazzy shuffles to lush baroque flourishes, but never has she connected both new and old techniques with such rich sonic detail. Which also applies to Holter herself as a singer - where she's manipulated distinct vocal modulations in the past -- she harmonizes against discordant, improvisational free jazz with haunting effect on Voce Simul -- it's unusual to hear how she nakedly sets her voice in the forefront with such dramatic clarity against luscious, gargantuan strings in Colligere. But Holter, ever the mercurial performer, also regresses to amateurish, echoing howls in I Shall Love 2, a more accessible bookmark on the album where her lazy drawl somehow contradicts the song's joyful, overflowing release. It's easy to lose the plot while listening to Holter's spontaneous craft, but given how she allows herself to take many unpredictable risks, the chaos she unravels can be truly intoxicating. Aviary is unarguably perplexing. That said, it also showcases a songwriter who, despite working through her contradictions by fighting the creative process with some defensiveness, is fully aware and confident of her tenacious perfectionism. It does run through the entire gamut, from the beautiful solo piano concerto of the aptly titled In the Garden Muteness to the sweeping incandescence of Words I Heard. All these forces are at play, both subtle and dynamic, dancing around each other with no measure of continuity. But despite Holter's all-around meticulousness, Aviary never comes across as careful or rigorous. She engages in artful replication, seeking to understand those voices she successfully reconstructs with a feeling of apprehension and anticipation. And in the process, leaving her own imprint for others to also discover in centuries to come.